Check our quality certifications here. Quick service restaurants typically need a large quantity of placemats in a short period of time. 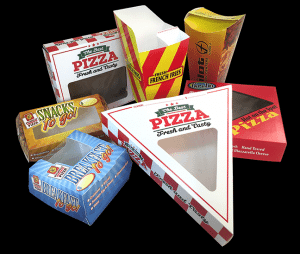 They also continually update their trayliners and custom meal bags based on seasons, branding, and promotional programs. OlymPak’s creative design team has been fulfilling these needs for decades and will continue to do so for all our clients, old and new. Our premier printing services also meet the requirements of our clients in a professional and timely manner. Individual restaurants need specifics based on local geography and special events at their location. OlymPak’s creative team provides unique designs, customization, and consistent service. Our team is built to help with localized marketing without compromising overall brand strategy. The talented and experienced staff at OlymPak will save you time and money with our industry knowledge and expertise. If you are looking for more information or quotes for your quick service restaurant, please inquire on our contact us page.